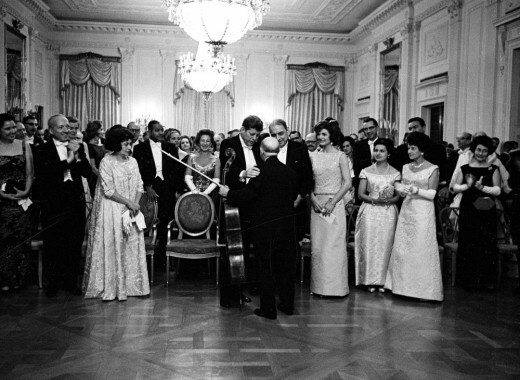 On February 22, 1963, President John F. Kennedy, by executive order 11085, re-established the Medal of Freedom to the Presidential Medal of Freedom. “SECTION 1. Medal established. 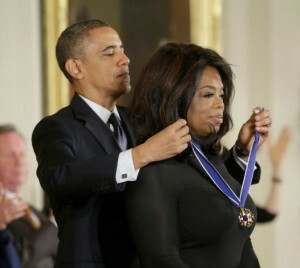 The Medal of Freedom is hereby re-established as the Presidential Medal of Freedom, with accompanying ribbons and appurtenances. The Presidential Medal of Freedom, hereinafter referred to as the Medal, shall be in two degrees. “SEC. 2. Award of the Medal. 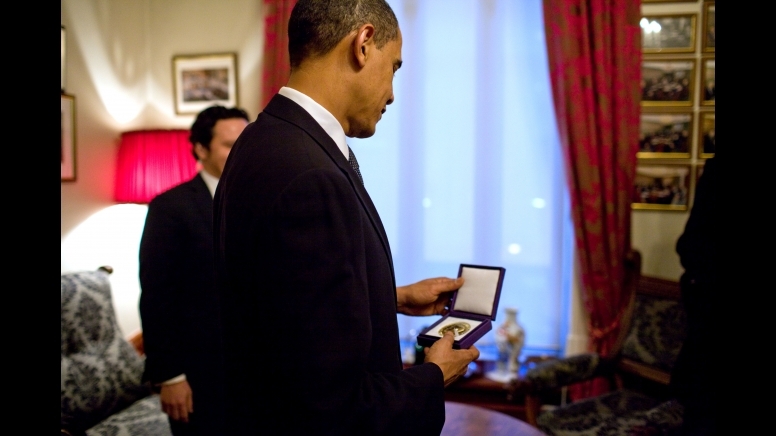 (a) The Medal may be awarded by the President as provided in this order to any person who has made an especially meritorious contribution to (1) the security or national interests of the United States, or (2) world peace, or (3) cultural or other significant public or private endeavors. “(b) The President may select for award of the Medal any person nominated by the Board referred to in Section 3(a) of this Order, any person otherwise recommended to the President for award of the Medal, or any person selected by the President upon his own initiative. “(c) The principal announcement of awards of the Medal shall normally be made annually, on or about July 4 of each year; but such awards may be made at other times, as the President may deem appropriate. “(d) Subject to the provisions of this Order, the Medal may be awarded posthumously. 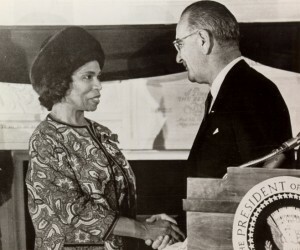 The first Presidential Medals of Freedom (33 total) were awarded December 6, 1963 by President Lyndon Baines Johnson (Vice President under Kennedy). You may want to do a search on the names. In addition to J. Clifford MacDonald Pope John XXIII was coffered posthumously. And President John Fitzgerald Kennedy also received a medal posthumously. 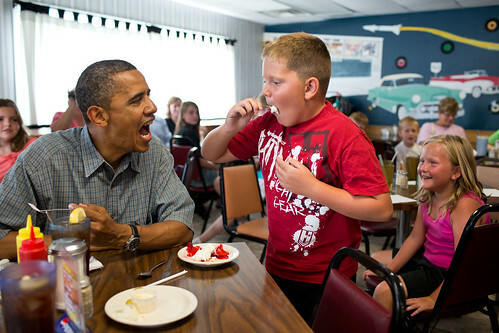 Pie is the President’s favorite dessert. So, if you’re a baker in the DC area, enter the The Makes-Me-Wanna SHOUT! Pie Baking Challenge presented with Eatonville Restaurant. The contest is looking for the BEST HOMEMADE PIE in the Washington, DC metro region. First Lady Michelle Obama has dined at Eatonville 3 times. No fees or purchase required to enter. Home and amateur bakers 18 years and up residing in the Washington, DC metropolitan area only have to submit a pie recipe (crust and filling) and the pie story. 12 semifinalists will compete in the first public judging held at Martha’s Table. The final five round will be at Eatonville Restaurant. A portion of the proceeds from the contest support Martha’s Table, the 2013 beneficiary. Entry forms are due February 4, 2013 and available online at www.shoutbakingchallenge.com. First prize for the winning baker is $500, your winning dessert featured on the Eatonville Restaurant menu, $250 gift card from King Arthur Flour, and a 3 hour consultation with Operation: Eatery on getting their own baking business started on the right foot. The Makes-Me-Wanna SHOUT! Baking Challenge is creating community around food by baking and making memories. 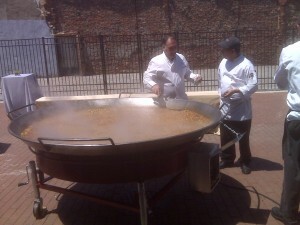 Star chef and restaurateur Jose Andres was in town this week with his next big thing – the giant paella pan. I believe the Jolly Green Giant size cooker made two public appearances in town this month — at the White House Farmers Market which is open for business through November 18; and a special preview of a new joint venture between Ridgewells and Jose Andres Catering at the Long View Gallery on 9th Street, across from the Walter Washington Convention Center. Jose is probably the primary person who made tapas or the little plate acceptable to DC diners accustomed to measuring food quantity against price. I remember going to Andres’ Jaleo opening week just to enjoy a pan of paella and sangria. You could find paella here and there in DC, but outside a backyard party with Spaniards, Jaleo was as close as I could get. That’s Jose presiding over the paella pan in the back of the gallery. This may be Ridgewells’ reawakening. Let the white linens be damned. It’s been two days since the 2nd State Dinner for the Obama Administration at the White House. So far no after-party drama. It was the first State Dinner for the new Social Secretary Julianna Smoot. Smoot dashed, flashed a quick smile and waved to the cameras, and that was that. 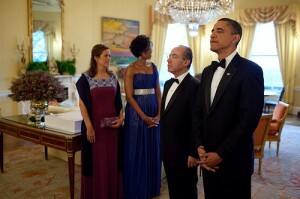 This time the honored guests were President Felipe Calderón of Mexico and his wife Margarita Zavala. A celebrity chef was brought in: Rick Bayless of Chicago…a favorite of the first couple. Robin Givhan and Roxanne Roberts of The Washington Post were on First Lady and State Dinner duty (what appears to be a pro forma assignments for these Style writers). Robin also covers fashion for the Washington Post, but is now DC based as the feature cultural writer covering the Obama administration. I feel an eclectique interview coming on. There’s more to this picture than just the protocols of diplomacy. I’m curious about what happened and what was said off camera related to immigration, migrant workers, drugs, crime, trade, and other topics in which one country’s actions impacts the other. How about that oil spill? After all, it is in the Gulf of Mexico is it not? Even Michelle Obama got her share of the conversation when she and First Lady Margarita Zavala visited an elementary school in Silver Spring, MD. A second grader revealed to the First Lady that her mother didn’t have papers and President Obama wants to send her mother away. I tell you, be careful what you say around kids. I feel bad for that little girl when her family saw the story. You can read Robin’s State Dinner reports here, and here. The second story features three organizations that were invited to the party: Mary Center, Martha’s Table, and Miriam’s Kitchen (where I’ve volunteered to serve dessert during the Big Read). First Lady Michelle Obama has visited or volunteered at these non-profit groups. Update: The President’s Budget for FY 2011 is available here (192 pages total). The total is $3.2 trillion. I’ve never typed or written that many zeros in my life. Overviews and introductions by the White House Office of Management and Budget are available here. Critiques are available everywhere, but there’s a decent chart of where the money’s coming and going on Washington Post.com. Update 2: And an excellent chart on the NY Times website. Hat tip: JackandJillPolitics. The President is about to submit his FY 2010 budget to Congress. The pop out characteristic of the budget is reining in the deficit through freeze on discretionary spending in certain non-defense and homeland security areas, phasing out ineffective or redundant programs (some National Park Service preservation programs will take a hit), and top it off with an offering to the American god of “tax cuts” for the middle class, and more support to programs for education and job creation. There’s more but the grand total of the budget proposal is $3.8 trillion. There are certain core principles our families and businesses follow when they sit down to do their own budgets. They accept that they can’t get everything they want and focus on what they really need. They make tough decisions and sacrifice for their kids. They don’t spend what they don’t have, and they make do with what they’ve got. It’s time their government did the same. That’s why I’m pleased that the Senate has just restored the pay-as-you-go law that was in place back in the 1990s. It’s no coincidence that we ended that decade with a $236 billion surplus. But then we did away with PAYGO – and we ended the next decade with a $1.3 trillion deficit. Reinstating this law will help get us back on track, ensuring that every time we spend, we find somewhere else to cut. This week my debit card fell out of my jacket pocket at a gas station (probably while going for my car keys). It took no time for someone to pick it up and go shopping at that same gas station. Fortunately, my next stop was the bank and that’s when I put the stop on the card. I was lucky. Only one illegal charge was made on the card – $75 – which has been removed from my balance. (How many lottery tickets did that person buy?) But the incident put me on a cash-only basis, i.e. pay as I go. I have to admit, I spend less without the card. Perhaps for me it’s a “cash in hand” basis. I do want to note that the old card was not signed and question the gas station staff’s process for not requesting an i.d. which is required when a credit card is not signed. What do we risk for convenience and speed? There’s plenty of blame and responsibility to spread around for fiscal inconsistencies and malpractice. The President’s budget freezes will be debated on the grounds of whether they will be effective for better or worse. Some critics call it political theater; others don’t think they go far enough. I’m ready and eager to work with anyone who’s serious about solving the real problems facing our people and our country. I welcome anyone who comes to the table in good faith to help get our economy moving again and fulfill this country’s promise. That’s why we were elected in the first place. That’s what the American people expect and deserve. And that’s what we must deliver. A week or two after the attacks on the World Trade Center in 2001, I made a trip to NYC for a few days to attend a film market. During that trip I found myself in a small peace demonstration near NYU. Honestly, I was there to meet a friend who was asked to provide music for the demonstration. The protesters were made up of students and a few non-students, mostly Latino, American Indian, White American. In my gut of guts, I knew the U.S. was going to war in Afghanistan. I knew there was going to be a little something-something in response. Just a few months earlier the Taliban were blowing up 2,000 year old Buddhas to purify the landscape for a fundamentalist Islamic state, and human rights violations were committed against Afghan women. My concern regarding military action was whether President Bush, Cheney, and the other “deciders” were absolutely certain, without a doubt, Afghanistan was the hub of the 9-11 attacks. Was Afghanistan the smoking gun? Have we tried everything else? Was this a just war? Our demonstration circled the park a few times then went inside to talk about what it all meant. I was struck by the surprise and shock of the demonstrators who were just getting their first taste of racial profiling for being Arab, Muslim or resembling one or the other. I was surprised by their surprise. I thought, “Welcome to my world.” It seemed profiling was the loss of innocence for people who thought not bringing attention to your cultural, ethnic, racial, religious self, kept you out of trouble here in America (maybe not elsewhere). For some reason, I imagine President Barack Obama’s Nobel acceptance speech having a similar impact on the Nobel committee — a message from a leader who is actively engaged in a war and accepts his role in it as well as the prize. If there is surprise, there shouldn’t be. Neither should there be surprise from candidate Obama’s so-called “disillusioned” supporters who are responding as if they are hearing his position on Afghanistan for the first time. Candidate Obama was always clear about his intentions for Afghanistan, Pakistan and that region. Willful ignorance or wishful thinking doesn’t preserve one’s perceived “innocence” or purity. Obama’s Nobel acceptance speech was one for the grown ups — people who have lived through the rising and setting tides of life and have accepted that there is no “either/or” kind of existence more both/and. I’m not pro-war. But I have not been directly in contact with one either, so I’m sitting in a cozy spot to mull this one over. Still, anyone who loves war, needs to be on a big comfy couch. I get a pain of anxiety every time there’s a major military something. At the same time, I’m behind the men and women who serve. I don’t want these men and women sent on a fool’s errand when it comes to war. I’m for the removal of Don’t Ask, Don’t Tell so all who want to serve can serve. All I expect of the men and women who join the military is to be totally clear about what they are committing their lives to. War may be part of the job. Another thing I’ve come to realize is that peace activism and pacifism are not one and the same. Yes, in peace or anti-war marches there are staunch pacifists in the crowd who aren’t Amish or MLK, Jr., but there are also people in the group who support liberation movements; and in some cases those movements turn violent. Even in American history, peaceful abolitionists invited John Brown to their dinner tables, and raised money. John Brown’s raid on Harpers Ferry is now considered an impetus for the Civil War and the emancipation of enslaved African Americans (after nearly 200 years). But it’s hard to grow a movement if you hold fast to the belief that the U.S. doesn’t do anything for good especially outside its own borders. And with this premise, as E-Notes writes, these opinions do not acknowledge the real threat of terrorism or bring an alternative to the table to stop it in its tracks. Obama’s Nobel speech left me with the desire to go into a seminar and break out rooms to sift through the political, philosophical, ethical, moral, and practical elements of war and peace minus Tolstoy. If there was any surprise for me it was the word “love” mentioned twice. “Love” is a word rarely used in political discourse and certainly not from a “war President.” And, in true Obama fashion, there’s that benediction-like flourish at the end. Dr. Martin Luther King, Jr., who received the Nobel prize in 1964, never ran for office (I doubt he ever would). And the inevitable scrutiny of his character and intentions was cut short by his assassination in 1968. Any expectations of a King moment from Barack Obama this week in Oslo was both unrealistic and unfair. The Nobel Prize is not a perfect prize or solution for a perfect peace. The planet still spins when Oslo welcomes its prize winners each year in December. When all is said and done, it is the Nobel prize winners who struggle with the questions and decisions of war and peace, freedom and oppression when they resume their lives and responsibilities in the real world. Barack Obama’s Peace Prize lecture/acceptance text. YouTube video.